Louise Pearlie first appears in LOUISE'S WAR, an historic mystery/romance that tells of the adventures of a young widow working with the OSS (nascent CIA) in wartime (WWII) Washington, DC .In that first volume, North Carolina native, Louise, discovers her talents and grapples with how to help a Jewish friend stranded in occupied France. 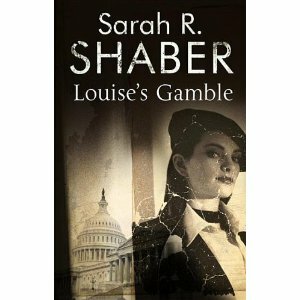 Having created a thoroughly likeable heroine, Shaber gifts us with another look into Louise's life and the Washington of the 1940s. Now, in book two of the series, LOUISE'S GAMBLE, the young widow is still working for the OSS and living in the boarding house arrangement so common in wartime Washington. We learn more about the people we already met and are introduced to new facets of her life. We see that in her spare time, Louise does volunteer work, knitting for servicemen, and at that knitting circle she meets Alessa di Luca, an Italian woman who appears to be an impoverished immigrant. We and Louise later discover that Alessa is a wealthy political refugee from Mussolini's rule. The spy action and murder mystery of this novel turn on Alessa's difficulties and a little known fact of WWII history, the cooperation of the "Mafia" with US authorities to keep goods moving freely on the New York docks. Saber's series is carefully researched. The descriptions set us firmly in the historic moment.The fast pacing of the mystery and spy action of the novel leaves just enough space between beats for readers to catch their breath and enjoy the characters and the wonderful scenes of shopping and lunching in old-time Washington. I can't wait to read the next one! Joan Leotta recently interviewed author Sarah Shaber. Please click here to read the interview. Copyright © 2012 Joan Leotta. All rights reserved. Reproduction in whole or in part in any form or medium without express written permission of Over My Dead Body! is prohibited. OMDB! and OMDB! logos are trademarks of Over My Dead Body!